Facebook has just released the Messenger app for Windows 7. It’s been available for iOS and Android for some time too. 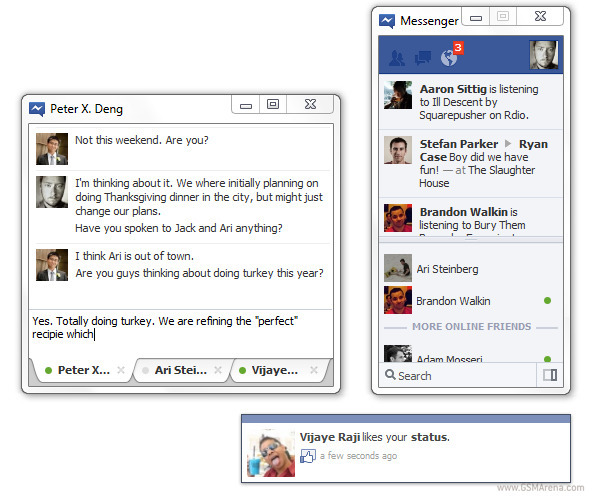 The app does exactly what it’s supposed to do – bring the Facebook chat outside Facebook. But there are a few more features too. On the top of your online friends list you get their latest updates too – just like it’s on the Facebook’s Sidebar. There are also on-screen updates for your notifications. Finally, you can dock the app at the left side of your screen and you will have a fully functional Facebook Sidebar outside of your web browser. Frankly, if you are a Skype user, you have most probably connected your Skype with Facebook already, so you won’t need this Messenger. In any other case just hit this link for the installation package. You don’t have to worry about any updates, the app takes care of that automatically, in background.